The only Medicaid plan owned and operated by the local safety hospitals in Broward County, Florida, Memorial Healthcare System and Broward Health, the SFCCN receives millions in Medicaid funding every month from the State of Florida. So how is the SFCCN spending those Medicaid tax dollars? 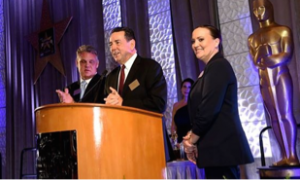 The SFCCN recently headlined as the main sponsor for a luxurious gala at the Seminole Hard Rock Casino, in Hollywood, Florida. 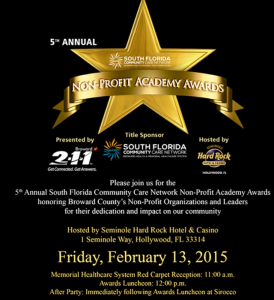 At the expense of its taxpayers and using dollars designated for patient care, the SFCCN was the Title Sponsor for the 5th Annual Non-Profit Academy Awards held there on February 13, 2015. **(Above) SFCCN CEO John Benz presents at the Hard Rock Casino gala. 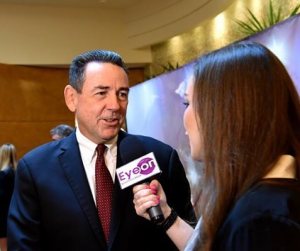 Partygoers and community leaders were treated in the most elite fashion at the Casino event, which featured a red carpet reception, compliments of the Memorial Healthcare System, whose executives serve as the SFCCN leadership. According to the event postings, the event featured entertainment, food and alcohol, compliments of its SFCCN Title Sponsor. Concerns of questionable expenses and price disparity have also been raised by local columnists Dan Lewis and Pulitzer Prize winner, John DeGroot, whose websites feature the latest information regarding monopolization and misuse of public funds. According to the reporters, the same Medicaid patients served by the SFFCN and referred directly to its member hospitals can expect to pay vastly different rates, as much as 30% more at Memorial, who has no competition in its service area. Furthermore, statistics provided by the Broward Regional Health Council revealed that the average HIV/AIDs patient can expect to pay $97,877 at Memorial Regional versus $53,877 at Broward Medical, amounting to an 82% difference. Sickle cell patients can expect a reported 92% rate hike. Regulators have already begun questioning the patient referral process and price disparities.